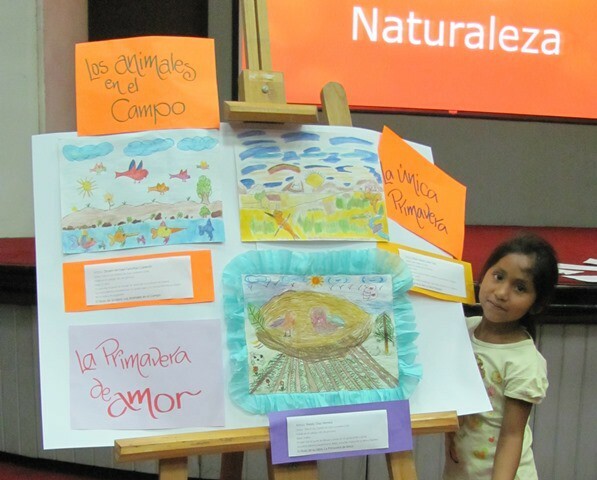 Last Monday was the exhibition of works created by 20 young Project Chiclayo artists who participated in a 4-week series of workshops called “Las Maravillas de la Naturaleza“, or “The Wonders of Nature”. 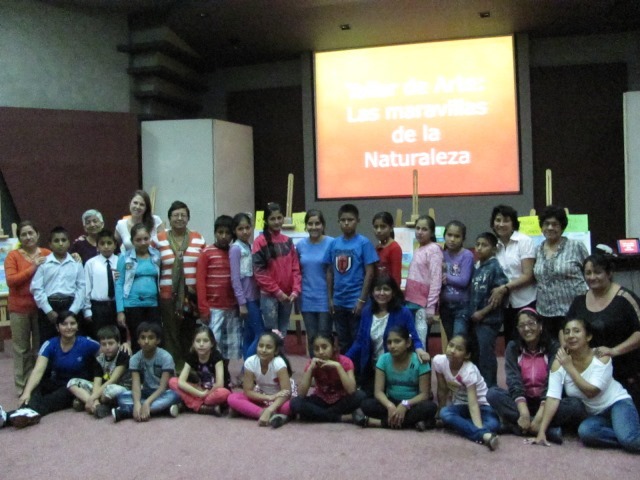 The weekly workshops and closing exhibition took place in the ICPNA (Peruvian-American Cultural Institute), that graciously offered free use of their auditorium. Considering that Project Chiclayo programs normally take place in modest living rooms and community spaces, we all felt spoiled to be in a huge space with air conditioning, carpet, projector, and sound system. The kids really enjoyed getting comfortable on the carpeted floor as they worked away. 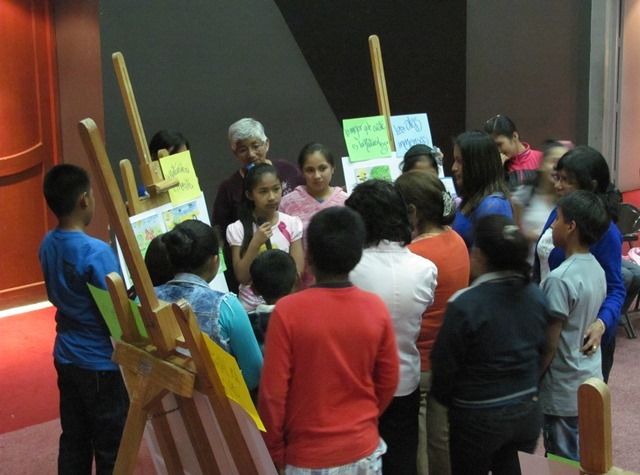 This workshop series was open to Project Chiclayo 20 participants in Grade 5 and up prepared to dedicate themselves to four (weely) two-and-a-half-hour workshops and final exhibition in week five. I was thoroughly impressed by the high level of concentration and dedication throughout. 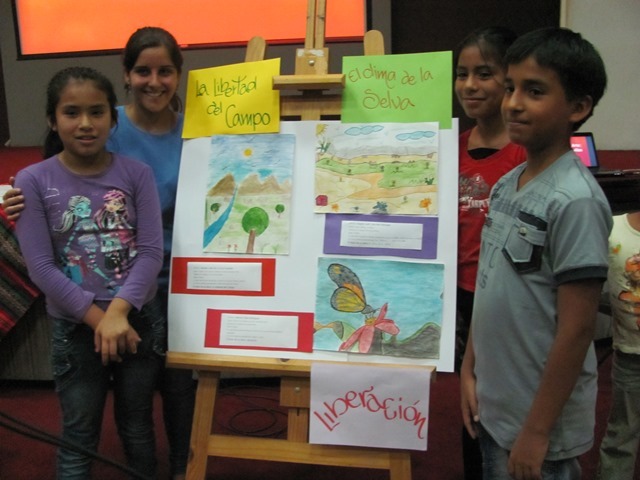 Not surprisingly, kids were eager to come to a safe space where creativity was welcomed and art supplies provided. They arrived ready to jump into projects and cooperate in sharing supplies and small tables. The first day began with a bit of getting to know one other as the participants were from 6 different places: 3 sectors of the city district to the north of Chiclayo (in José Leonardo Ortiz), 1 sector of Chiclayo itself, 1 sector in the city district to the south (La Victoria), and also the Pacific seaside village of Puerto Eten. We played a game that encouraged participants to talk about why they like drawing and painting, what their favourite colours and hobbies are and why, what subject matter they most enjoy drawing/painting. I then used the projector to show paintings by artists from Peru and around the world, which participants enjoyed commenting on. [These are kids that love art, but that have had very little formal exposure to it. They live in city sectors considered ‘slums’ by many poverty line standards, where the arts are hardly (at least publicly) valued.] The rest of the time was dedicated to doing two pencil sketches following the theme “The Wonders of Nature” and then testing out brand new watercolour pencil crayons, which none of the young artists had used before (so many smiles when they figured them out!). Homework for the following class was to bring in two sketches of subjects they would be interested in drawing for their final piece, perhaps inspired by their lives, experiences in nature and artwork we had viewed earlier on. 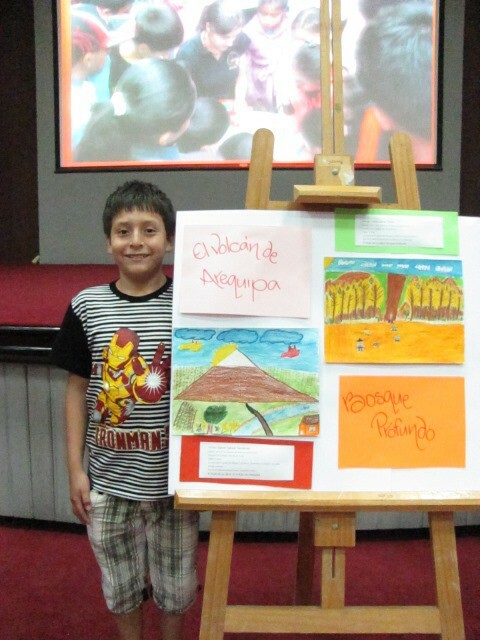 This energetic 11-year-old was proud of his drawing ‘The Volcano of Arequipa’, depicting a mountain in Arequipa, southern Peru he had learned about in his treasured atlas, which he brought to every workshop. The piece to the right, ‘Deep Forest’, was done by a shy 11-year-old girl, inspired by the colours of Van Gogh. On Day 2, most students arrived with at least two sketches, as well as a print out of a painting by one of the artists they had been introduced to (even though I never asked for the latter). They spent the session planning out their final pieces with a combination of their homework sketches and new sketches inspired by a selection of photos I had brought. It was fun to guide them and question their ideas, more than anything to make them think about drawing things from new perspectives, and shy away from quick ‘doodle’ styles for flowers (the ‘typical’ flower, drawn with five petals around a yellow centre), simple butterflies, trees that they see in the media which don’t even grow in this region (and which participants have never seen in person), the ‘top corner of the page’ sun, perfectly puffy clouds, etc. Day 3 involved a lot of hard work to advance with their pieces and Day 4 involved polishing their works and adding details such as shading, more layers of colours, more leaves and other such detailing. Throughout each session there was a background instrumental music from Peru and other countries. I circulated to chat with participants about their work and asked them questions such as what they knew about the species they were drawing, and if they knew that some of them (such as birds) were in risk of extinction. They knew a lot about the subject matter they had chosen and were happy to share their knowledge among peers. ‘The pureness of the water’ (left) was done by a sixteen year old student. 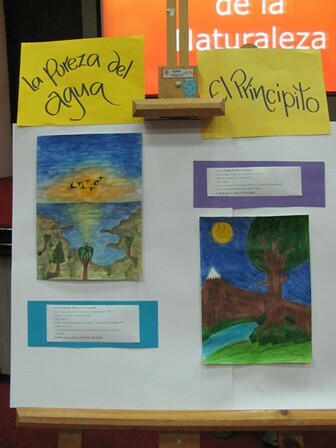 ‘The Little Prince‘ was done by a nine year old girl who named her work after the book of the same name, that she read two years ago in Project Chiclayo–oh, the joys of reading!! (Sadly, these two artists were sick and could not attend the exhibition). The little sister of a boy who participated in the workshop was excited about all the artwork and wanted me to take a photo of her with her brother’s drawing (top right; “The Only Spring”). During the first part of the exhibition, artists stood by their work to answer questions and talk with the public (relatives and CE staff) about their inspiration. 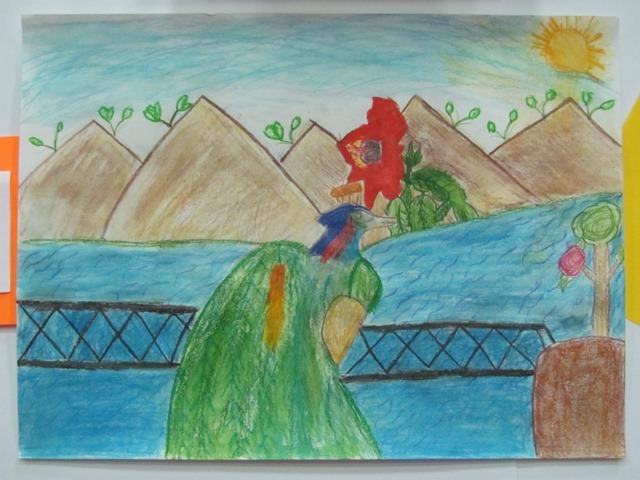 A detailed drawing of peacock by a 10-year-old boy from the village of Puerto Eten. the works of others and listen to each artist talk about their piece. to promote the beauty of nature and importance of its protection. many younger siblings and a few friends. The artists left with extra pride and satisfaction. By now, I have seen many of the participants already during Reading Kite visits and some were excited to tell me that they have already framed their artwork and certificate and displayed them in their living rooms! They all asked when the next workshop will start, but sadly, it will only be in the New Year as students will soon be in final exams (the Peruvian school year ends in mid-December). Luckily, I will still be offering other art workshops up until the Christmas holidays.